Odd Pair Sudoku puzzles add extra constraints to regular Sudoku by labelling some pairs of neighbouring squares which contain values that sum to an odd value. Put another way, some pairs of squares where one value is odd and the other is even are indicated. A Odd Pair Sudoku puzzle consists of a standard Sudoku grid with the addition of "odd pair 'o' markers" between some squares. These indicate that these pairs of squares contain values which sum to an odd number. Unlike some other Sudoku variants, not all odd pairs are necessarily marked. So if there is no marker between two squares then these squares may or may not sum to an odd pair - you just don't know. The reason for this is that if I was to mark all odd pairs then you could immediately label all squares as either odd or even, at which point you'd have two smaller separate puzzles that happen to overlap! 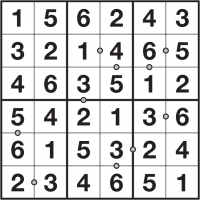 To solve an Odd Pair Sudoku puzzle you must place 1 to 9, or 1 to whatever the size of the puzzle is, once each into every row, column and bold-lined rectangle while also obeying the odd pair markers. Look at the top-right bold-lined 2x3 box in the solved puzzle on the left. The 6 and 5 form an odd pair, since 6+5=11 and 11 is odd. Also 6 and 1 form an odd pair, since 6+1 = 7 is an odd total. As mentioned above, in other words wherever there is an odd pair marker than one square in the pair contains an even number and the other contains an odd number. Every Odd Pair Sudoku puzzle only ever has one possible solution, and it can always be reached via reasonable logical deduction. In other words, guessing is never required. Odd Pair Sudoku puzzles on puzzlemix appear at a wide range of sizes and difficulties. Usually they are 6x6, 8x8 or 9x9, in which case you must place 1-6, 1-8 or 1-9 once each into every row, column and bold-lined rectangle. These bold-lined rectangles are 2x3 for 6x6 puzzles, 4x2 for 8x8 puzzles and they are 3x3 for 9x9 puzzles. Are you searching for help with Odd Pair Sudoku puzzles? Stuck on solving Odd Pair Sudoku? Don't know the instructions for Odd Pair Sudoku? Need Odd Pair Sudoku instructions? Want solving hints and tips for Odd Pair Sudoku? Then puzzlemix is the place for you to play Odd Pair Sudoku puzzles online. Looking for printed Odd Pair Sudoku puzzles? Visit Sudoku Xtra for puzzle magazines and books. Or are you looking for a Odd Pair Sudoku puzzle supplier? If so then check out Any Puzzle Media, my puzzle production company.